Charles Bassey is reportedly leaving Aspire Academy in Louisville, but he’s not planning to leave the state of Kentucky. Bassey, one the top nation’s top basketball prospects, has committed to Western Kentucky and plans to reclassify for 2018, allowing him to join the Hilltoppers next season, according to ESPN and other outlets Wednesday evening. 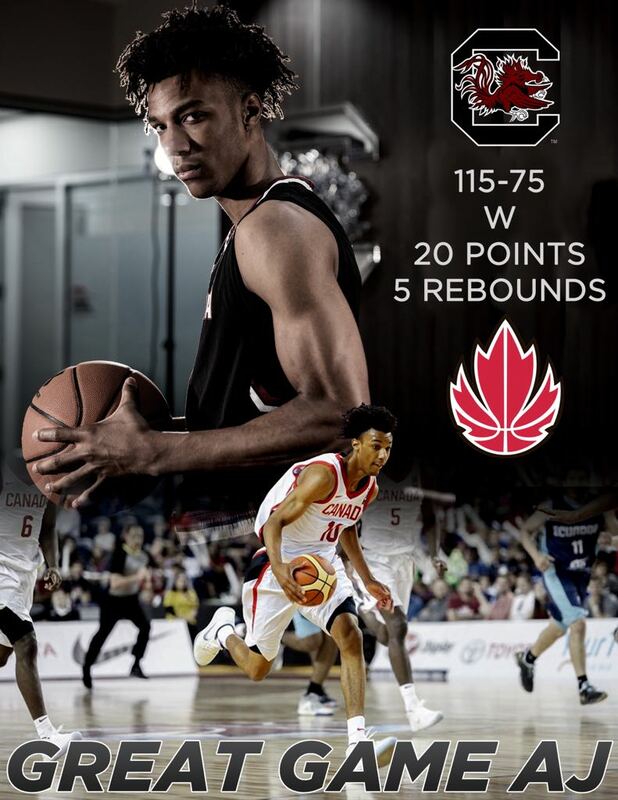 This week's FIBA Under-18 Americas Championship is a coming-out party of sorts for Andrew Nembhard. The 6-foot-4 guard from Aurora is fourth in tournament scoring with 17 points per game and second in assists with seven per game. His efforts helped Canada to a 3-0 record heading into Friday's semifinal against Puerto Rico. It's not like he has never been in the spotlight. He has already signed his letter of intent to play for the Florida Gators in the NCAA's tough Southeastern Conference. He earned his scholarship as a teammate of fellow Canadian RJ Barrett at Montverde Academy in Florida near Orlando. They led the school to the U.S. national high school title and an undefeated 31-0 season. There was a larger crowd than usual at YMCA Capital City basketball Sunday night. Why? I don’t know, but maybe it was a respite from the heat that’s been overtaking our electricity bills. Or maybe it was the Iowa debut of Talen Horton-Tucker, Iowa State’s top 2018 recruit who just might break into the starting lineup before the Cyclones open the season in November. WKU head coach Rick Stansbury wants to know why people are shocked 5-star recruit Charles Bassey chose the Tops. Chris Herren Jr., the former Portsmouth High star and son of ex-NBA player Chris Herren, has signed a financial aid agreement and will enroll at Boston College this fall. ESPN reported that he began summer school on Monday. Herren, a 6-foot-3 guard, graduated from Tabor Academy in June but was considering an additional year of prep school. Instead, he will join the Eagles as a freshman for the 2018-19 season. “We are excited to add Chris to our program. He is a dynamic scorer who possesses a high basketball IQ. His ability to shoot from long range and his play-making ability will fit our playing style well,” said BC head coach Jim Christian.